This pretty Dubrovnik Summer Festival poster from 1954 is my recently acquired vintage image which features cute little drawing of Lokrum and Dubrovnik Old Town in the background with some symbolic images of musical instruments and mask in the foreground. I am particularly attracted to this kind of blue-green and cool metallic colours of the poster that are rarely used in advertising these days. 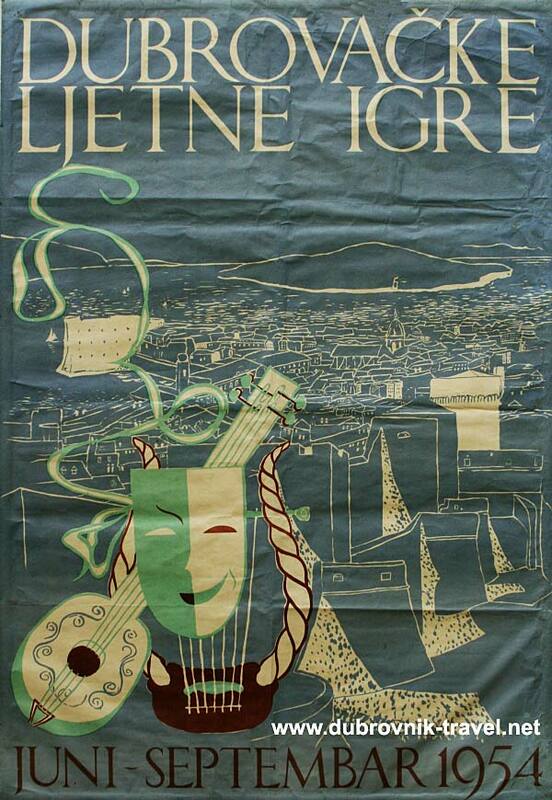 I also have, from the same period, another Festival poster – Korcula’ Moreska performance in Dubrovnik in 1950. Based on the very similar, almost identical drawing style, my guess is that both posters are created by the same author. If you like vintage stuff, check also Dubrovnik Summer Festival Advert from 1963 + read more about Dubrovnik Summer Festival which will start again this year on 10th of July.